For information about the history of Bradbury's Medium V.S. click on the title above. All material copyright David G. Best 2002 - 2009 and 2017 All Rights Reserved. 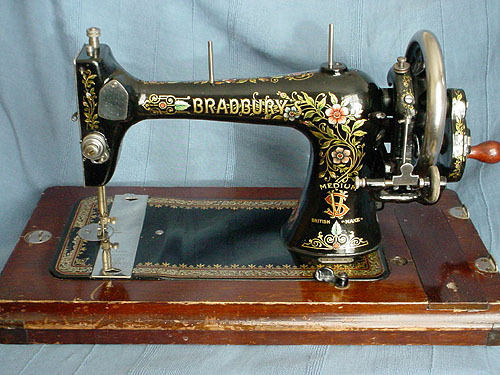 A Bradbury Medium (Vibrating Shuttle) Combination with floral decals and the 'Duke' on the bed of the machine. Note the intertwined V.S. just below 'Medium' on the pillar. This machine was probably made around 1907. 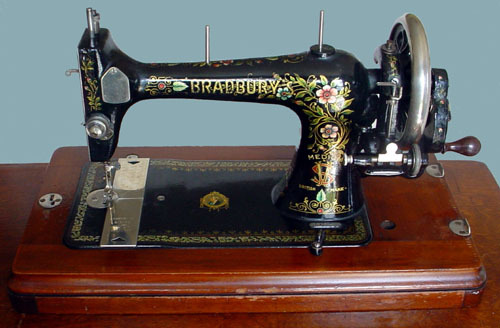 When used as a treadle it is held in place on top of the table by its feet which fit into four shallow holes. Two of which can be seen on the table top just back from the front edge. The two larger holes towards the right hand end of the table are for the treadle belt to pass through. 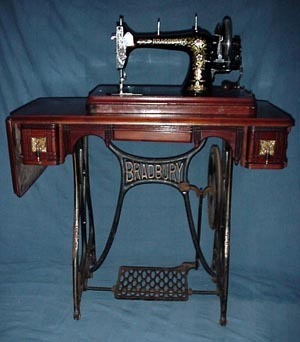 When required the machine can be easily lifted from the treadle stand and used as a normal hand machine. 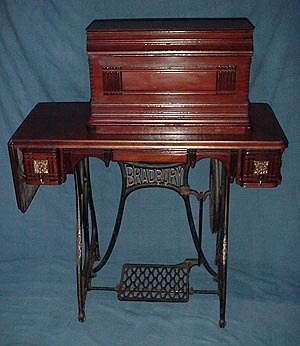 The treadle base has a flap, two drawers with tear drop pulls and a centre swivel drawer. In 1905 the Company advertised that the cabinet work & cover were solid Walnut wood not veneer, this later changed and the table of this machine is veneered. 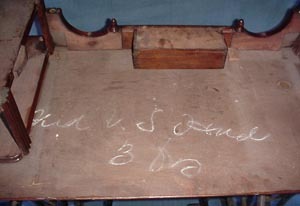 Partly obscured by the drawer fittings beneath the table is chalked 'Med V.S hand', this may well have been written when the machine was produced. The number and letters below the writing we think is '3 Dra' meaning three drawer? This machine has an original Bradbury accessory box. It has 'Medium' stamped underneath and it includes an illustration of the Bradbury Soeze, this design of box was used for other Bradbury Models. From the Medal tally we know the art work of the box dates from 1901 to 1904. 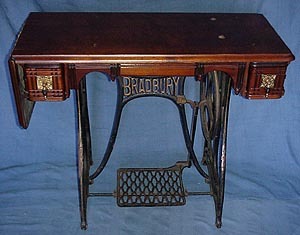 We are very grateful to Tony Feist who very kindly donated this superb Bradbury Machine to our collection. A later Medium V.S. model probably made around 1912, it has blue and pink flower decals which are in very good condition, but there is some wear to the decals by the needle-plate. The Company Trade Mark is on the pillar under the arm of the machine. By this time the Company had inserted an accessory compartment into the base. This machine was kindly donated by Paul Gallienne. 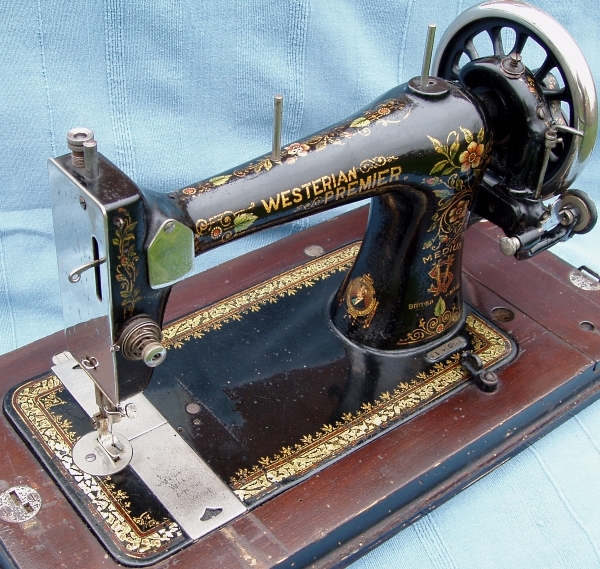 Identical to the above machine with the exception of the name on the arm which in this case is Westerian Premier. Made around 1912 the name would have been added for an agent probably operating in the South West of England as Westerian was the name given to people from the counties of Cornwall, Devon & Somerset. The Bradbury Trade Mark appears at the base of the pillar under the arm and the Medium V.S. decal is also retained. Approximately 20,000 Medium V.S. 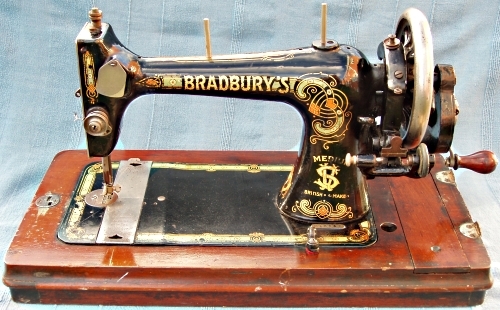 models were produced by the Bradbury company the majority of which had the flower decals as shown on the above machines. However the last approximately 3,500 Medium V.S. machines were produced the Celtic Knot pattern as seen here. This pattern is more usually associated with Bradbury's Family V.S. machine. The Company Trade Mark is on the pillar under the arm of the machine. This machine probably dates to 1920 and shows evidence of wear to the decals but is otherwise in good condition. It came with a coffin style cover.